My son always made me cut out the netting in his bathing suit, so when I saw the story behind the product, I knew this was for my son! So far, so good! He was swimming, tubing, knee boarding, and fishing and no complaints about comfort. Plus he thinks the band is cool. Great product! Awesome! Wish I Found This Years Ago! Chafing has ruined many a fun day at the waterpark and beach for my younger son. No longer! He LOVES these swimbriefs--he instantly put them on and then wore them all day, even though we weren't swimming. Thank you, thank you, thank you. My son LOVES these! After a day of boogie boarding and body surfing, he had no chafing! The fit is comfortable and no sand got past the waistband or legs. Getting a pair for my husband next! I got these for my son, and he really likes them. So far he has worn them for swimming, but he may also wear them for sports. My son loves it! He said it's totally comfortable. Will continue to buy as he grows. My son has suffered every single summer from swim truck rashes (and he is 11) and this is the first time he has been able to enjoy himself completely in comfort! Best product EVER! The swimbrief is a comfortable fit for my 14 year old son. He wears it under his swim trunks and wetsuit. His only issue is the legs of the brief rollup under his wetsuit when getting dressed and can be difficult to correct once you pass the waistline. son says their a bit snug and a tad short for his comfort level. a bit sticky when wet too. Wetsuits and board shorts can be uncomfortable—especially when you sweat or get wet. Not anymore, thanks to Turq. These smooth-fitting board short liners help prevent chafing and discomfort when you’re on the water or out being active. Wear them underneath your wet suit, swim trunks, or even athletic shorts and they provide a layer of comfort and protection. Turqs are made with hydrophobic microfibers that have been infused with silver to make them anti-microbial (and thus less prone to odor). They’re quick-drying and there are no irritating seams in the front, side, or back—just comfortable briefs, through and through. Form-fitting and supportive, but not compressive, Turqs aren’t limited to the water—you can wear them underneath cycling or gym shorts. 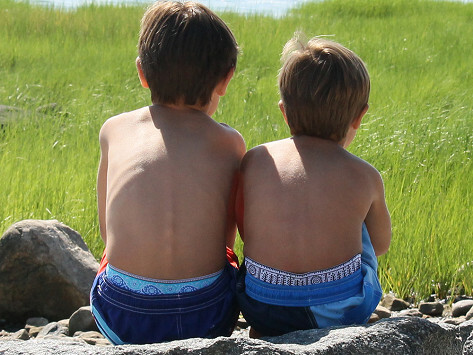 Founder Susan White’s two boys said their swim trunks “hurt,” but she couldn’t find any briefs designed to prevent chafing under board shorts or wetsuits. So she created Turqs. Today, athletes ranging from a professional wake boarder to a kitesurfing phenom have endorsed them.